Shown above is this mornings WRF-GFS forecast run from atmo - the graphic is 6am temperatures on 1 December 2010. These forecast temperatures are much warmer than the record low temperatures observed this morning, and considerably warmer (10 to 15F) than the current NWS forecasts for tomorrow morning. It will be interesting to see if the model forecast easterly winds during the early am hours actually develop. Temperatures this morning generally fell into the middle to upper 20s F. The airport reached 23F and Nogales had a low of around 20F, while atmo was warm at 27F. 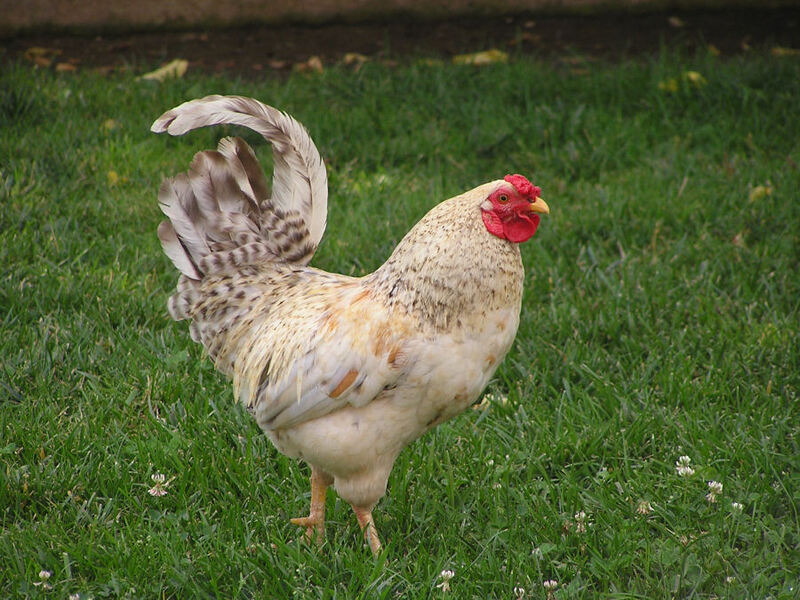 Locations that fell into the teens, or lower, were: Safford and Sasabe 18F, Stray Horse 17F, here at house 16F, Empire 15F, Rucker 11F, Douglas 10 or 11F, and coldest I found at Columbine 5F. 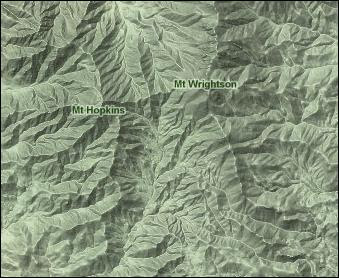 The RAWS sites on Mt. Hopkins and Rincon were relatively warm with lows of 30F and 25F respectively. 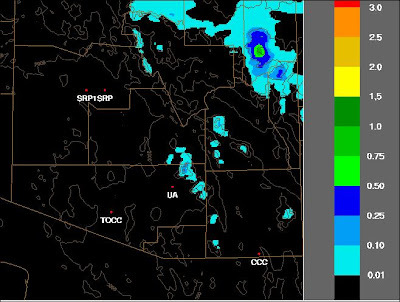 Three quite ugly RRS soundings from the Southeast at 00Z 30 November, 2010. I don't think I need to go into details. Both the WRF-GFS morning forecast run and also the NAM indicate that low-level winds will become easterly late tonight. This situation complicates the forecasting of minimum temperatures here in the Tucson area because some locales tend to stay windy through the night while others go calm. With below zero dewpoints, radiational cooling will be fierce, and I expect large ranges in the low temperatures within the metro area. The top graphic is the U of AZ WRF-GFS forecast of surface temps and winds valid at 6 am tomorrow morning (30 November 2010) and the lower figure is the same for 6 am on Wednesday morning (1 December). 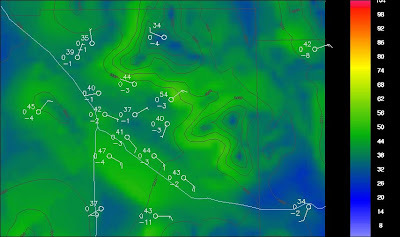 Both forecasts show complicated small scale structure in the wind and temperature fields, especially on Wednesday morning when stronger winds prevail though the night at some spots. Note that temperatures are much warmer on Wednesday morning with some points not getting out of the 40s or low 50s! The WRF forecast for TUS is 29F for 6 am tomorrow morning but 45F for Wednesday morning (current NWS grid forecast lows for TUS are 23F and 29F). Mt. Lemmon is forecast to be 17F at 6 am tomorrow morning but only 33F on Wednesday morning (current NWS grid forecast lows up there are 10F and 23F). Will definitely be interesting to watch how the next two mornings play out. It was a very chilly and windy day yesterday, as a portion of the western US trough came by at 500 mb. There were some very light spits of rain here at house and also at other low-elevations. However, snow showers were heavy enough to cause some accumulations and driving restrictions up in the Catalinas - a bit of a winter surprise. 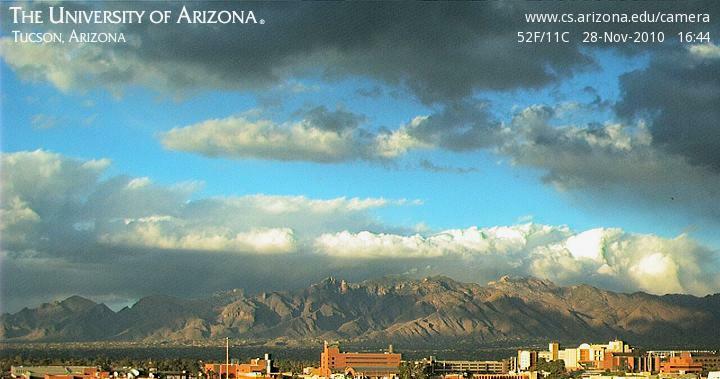 The top image shows snow showers sitting on the Catalinas about a quarter to 5 pm yesterday (Sunday, November 28th). The bottom graphic shows the accumulated precipitation forecast from the U of AZ WRF-GFS model run from modningh Friday night. That run indicated accumlations on the highest Catalinas for the period ending at midnight last night. Subsequent GFS model runs continued to keep the precipitaion focus on the Catalinas. The first snowfall of the season on Mount Lemmon caused authorities to restrict access on the road to Summerhaven to vehicles with four-wheel drive or snow chains on Sunday. The Weather Service issued a winter-weather advisory for Mount Lemmon on Sunday, warning of blowing snow, icy roads, low visibility and gusts of up to 45 mph. 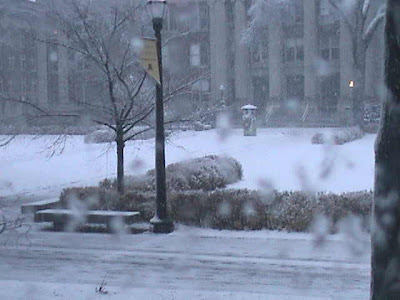 Shoemaker said the Weather Service had received reports of accumulation of about 3 inches of snow on the mountain around 4:30 p.m. and expected "about another inch or two." Although a good portion of the Tucson metro area has already recorded a freeze this year, either last winter or earlier this month, the official temperature site for the area, Tucson International Airport, has not. The lowest reading at the airport so far in 2010 has been 33 degrees on January 24th. The official NWS forecast calls for the airport to be near 29 degrees Friday morning as an Arctic air mass moves in. With the first freeze of 2010 at the airport likely to occur on Friday, this would rank as the 2nd latest first occurrence of 32 degrees or colder in a calendar year on record. The average first freeze date in a calendar year is January 9th. The low at TUS yesterday morning was 30F - so, the airport measured its first freezing or below temperature for the entire year of 2010 on Friday, as per above statement. 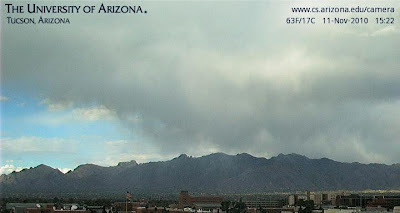 Low here at house (inside Tucson city limits) was 21F. At the house, yesterday was the 43rd morning low of 2010 with freezing, or below, temperatures! The 21F yesterday was the coldest morning of 2010, so far. If you're a gardener, there appear to be at least three plant hardiness climate zones within the Tucson city limits (perhaps four, but there are not enough observational data to determine the zones precisely). This morning (Saturday November 27th) the low at the house was 24F, while the airport official low was a relatively balmy 37F. Also of interest was the strong reversal between low (cold) areas and the mountain peaks (mild) this morning. For example, the Rincon RAWS (8209 ft MSL) site recorded a low of 37F, same as the airport, while the Mt. Hopkins RAWS (7120 ft MSL) site recorded a low of only 44F this morning. Finally, the RH has fallen to miserable, skin-cracking values, with dewpoints in the single digits or below zero. 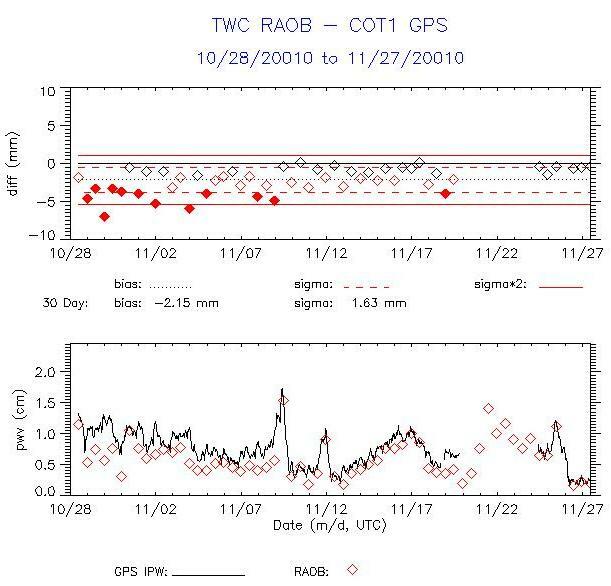 The graphic above shows the GPS and TWC raob comparisons of PW for the last 30 days. The RRS RAOB has been consistently too dry during the past month, but note that the last three comparisons have been very close and right around a ridiculously low 2 mm. Prime conditions for static electricity and also nose bleeds. In case anyone thought the bad RRS sonde problem had gone away, here's a quick look this morning - Black Friday. There are many strange looking soundings in the morning data, both out in the Northwest and down in the Southeast. Three examples are shown above. So it goes. Thinking of Chef Paul Prudhomme as Thanksgiving draws near! Definitely very winter-like over much of the country this morning. Top image shows this morning's 500 mb chart from NCAR RAP with very cold (temps -40C or lower) cutoff low over Washington state. 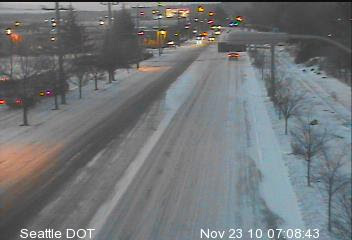 Middle image is webcam shot from Seattle, WA this morning, and bottom image is from the Univ. of North Dakota in Grand Forks, where temperatures are hoovering right around 0F. Here at the house the morning low was 28F, making this the 9th day in November with freezing or colder temperatures in the north part of the City of Tucson. 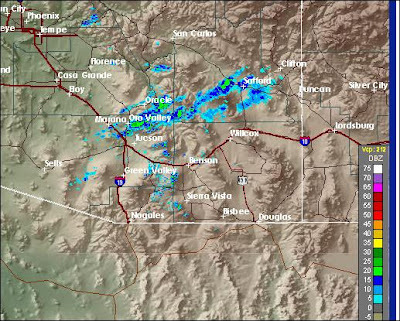 Yesterday's front brought mostly winds and scudding clouds to southern Arizona. In fact, even the WRF-GFS, which didn't forecast much - see earlier post, was a bit overdone for the Borderlands. I could find only 1 report of precipitation for all of the stations in eastern Pima County - that was 2/10s of an inch at Green Mountain in the Catalinas. Storm was much more intense in northern Arizona (where winds of 50+ mph and rain and snow were common) the Rockies and High Plains. 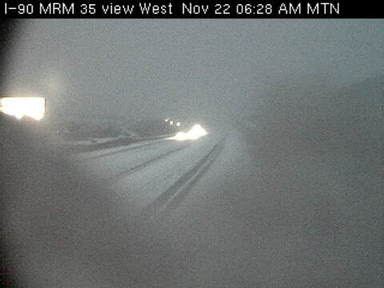 Top web cam photo shows interstates just east of Rapid City, SD, and bottom shot is of interstate near Flagstaff. Heavy clouds sitting on the Catalinas, and a smell of moisture in the air, make this the biggest weather morning in weeks! Top photo shows the Catalinas just after sunrise and middle photo indicates that Kitt Peak is in the clouds this morning. The cold trough at 500 mb over the West is ejecting a short-wave across the Great Basin today. This feature will bring signficiant snows to the Rockies and northern High Plains. Down here along the Borderlands, we'll catch mostly clouds, isolated showers, and some gusty winds. The bottom panel shows the U of AZ Atmo 06Z run of the WRF-GFS model today with its forecast of total rainfall ending at midnight tonight. The WRF forecasts only a slight chance of rainfall over south-central Arizona, keeping the bulk of this event up in the Rim country and White Mountains. Still, it's nice to observe more than wind and cirrus! “Following Hurricane….., then President Bush George Bush flew over …., and, even after that bird’s-eye view of things, returned to Washington, still undecided whether federal relief funds were truly necessary. Outraged community leaders demanded that Bush return for a street-level assessment.” Quoted from “Last Train to Paradise” by Les Standiford (subtitled – Henry Flager and the Spectacular Rise and Fall of the Railroad That Crossed an Ocean). I was quite amazed when I read this – the omitted words above are: … Andrew’s assault on South Miami – Dade County in 1992…. 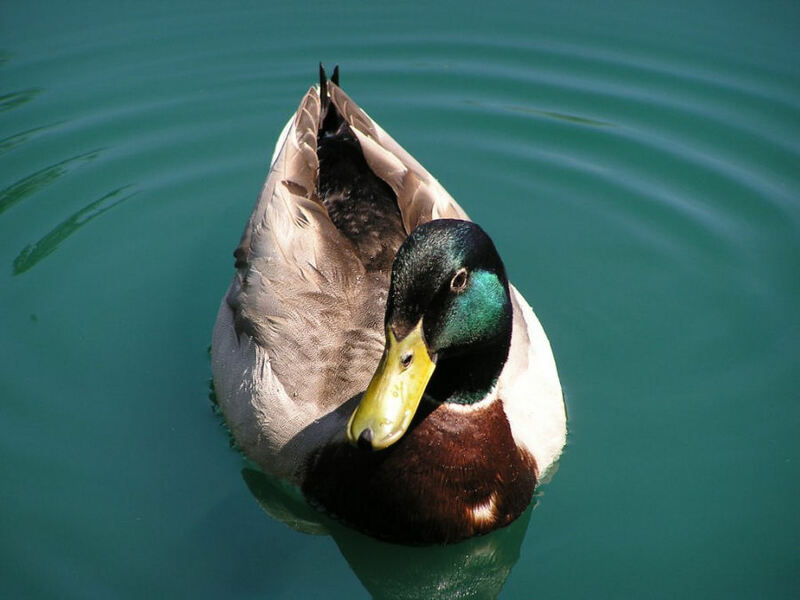 and … Homestead and its environs….. so, the president referred to was George H. W. Bush. Seems some of us never learn from any of our father’s mistakes! 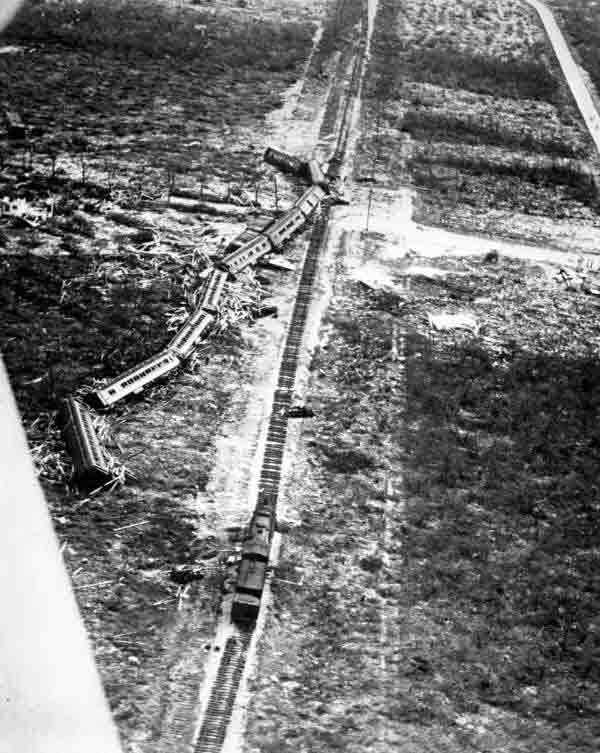 A book that is focused specifically on the 1935 hurricane, said to be the most intense hurricane to strike the US in recorded history, is: “The Great Florida Keys Storm of 1935 – Hemingway’s Hurricane” by Phil Scott. Perhaps A Bit Of Weather This Weekend? It has been a long while since there's been much in the way of weather here in the Southwest. The last time I measured rain in the gauge was back on the 21st of October. 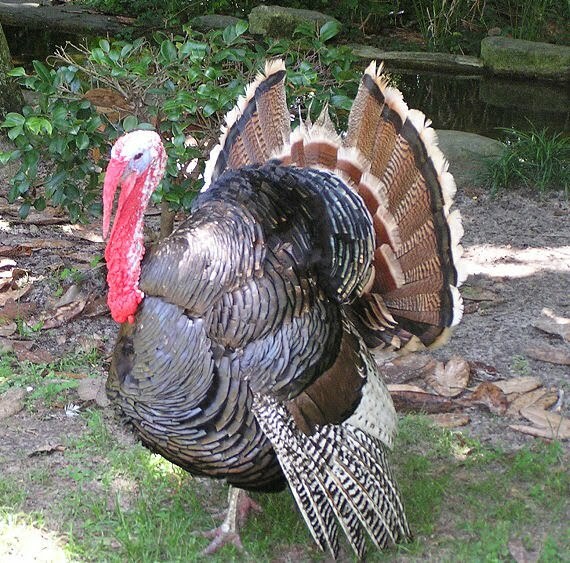 So far, November here is perfect, with not even a Trace of precipitation noted. Only weather worthy of comment has been the long run of days with low temperatures in the 20s and 30s (up to 10 now). However, the quite cold, 500 mb trough in the Northwest (top image) is forecast to deepen over the weekend, with a piece coming across the Southwest (700 mb forecast valid noon Sunday in middle). The NAM indicates that some 700 mb moisture will reach down across southern Arizona. 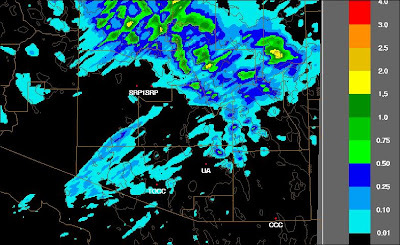 The NAM forecasts some precipitation in southern Arizona (60-h rain ending at 5 pm Monday in bottom image), but at this time keeps the rain out to the west of here. At least a bit to write about finally. After 7 consecutive days with morning lows at, or below freezing, temperature only dropped down to 34F this morning (Wednesday, November 17th). Still was about 10 degrees colder here than the "official" low down at the airport. Main thing this long stretch indicates about the weather setting is how quiet and calm the nights have been down here for over a week. 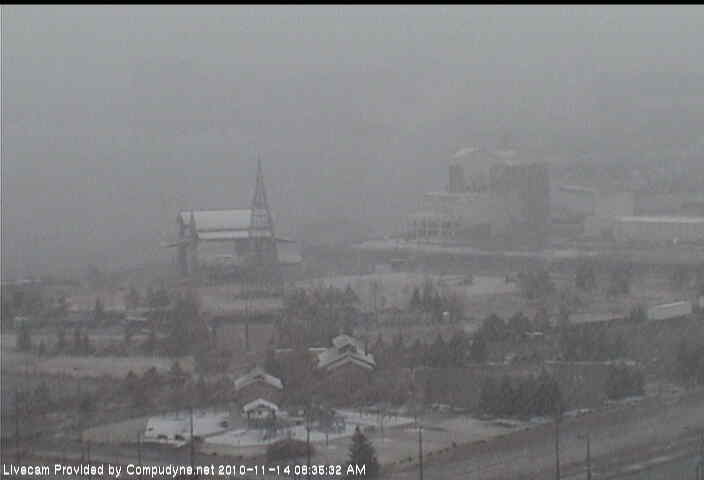 Photo shows that it is a dreary sunday morning up in Duluth, MN, as the snow storm exits into Canada. We've now had 5 consectutive nights with a low temperature of 32F or colder. 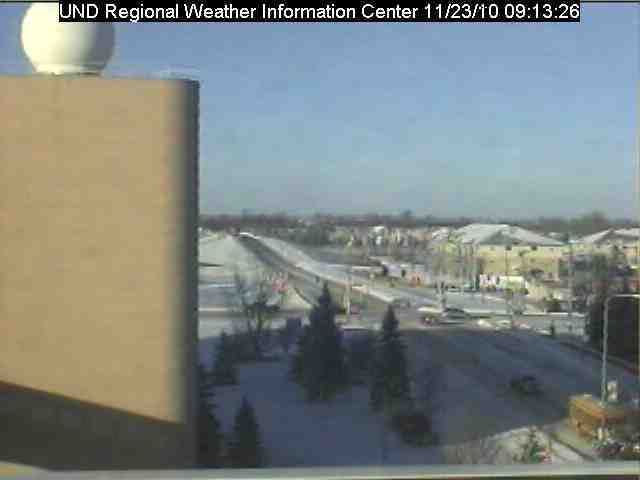 Coldest morning was yesterday with 26F and warmest was this morning (clouds drifting about during the night) at 32F. 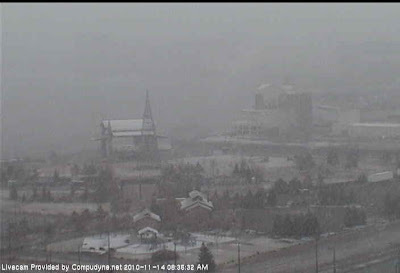 Science and Engineering webcam view from the University of Minnesota this morning. Here at the house it went calm overnight - thus, low temperatures up in north part of the Tucson city limits were very chilly. Minimum here at house was 27F - the third consecutive night with below freezing temperatures. Looks like the shortwave that went by here yesterday afternoon (see below) will bring the first significant snows of the late Fall to the upper midwest (MN and WI mainly) tonight and tomorrow. More cloudiness than expected this afternoon, coupled with cold winds, has put a definite chill in the afternoon. Heavy clouds and virga over both the mountains and lower elevations, along with some mountain snow showers. The very strong shortwave (see post below) has squeezed more out of the dry air than was indicated this morning. 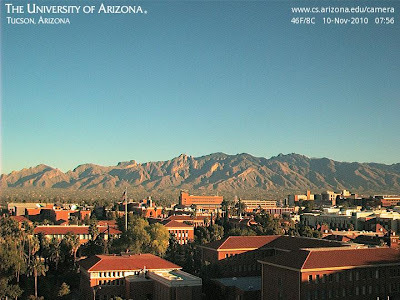 Images above show current visible satellite image, Tucson composite radar, and the view from campus looking north to the Catalinas. Brrrrr. 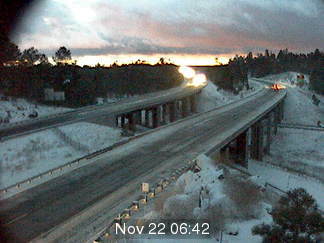 First, another morning with freezing temperatures here in the north part of the City of Tucson. The low here at the house again dropped to 30F, making two days in a row with below below freezing temperatures. Other parts of southeast Arizona were not as cold this morning as yesterday. Temperatures tomorrow morning will be very dependent upon wind conditions during the night and early morning hours. The Univ. of Arizona, Atmo, WRF-GFS run from midnight last night indicates that winds will continue through much of the coming night across the metro Tucson, keeping low temperatures in the upper 30s and low 40s. So, it could be a morning with drastically varying low temperatures, depending on small-scale wind conditions. The top figure shows this morning's 500 mb analysis from NCAR RAP. Note the extremely strong baroclinic zone across the Southwest, associated with the shortwave trough. 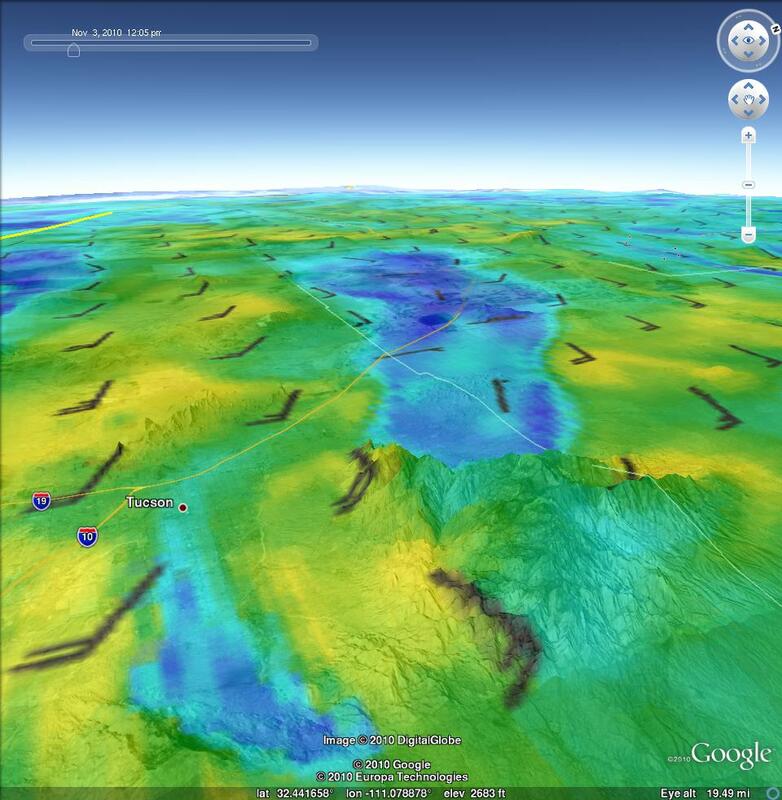 (Would certainly be nice to have a return of upper-air data in southern Nevada!) There is a strong vorticity maxima over southern California this morning and it is forecast to swing eastward across southern Arizona this afternoon (this morning's NAM 500 mb forecast for 5 pm this afternoon is shown in bottom graphic). Unfortunately, the strong forcing for vertical motion will be acting on an air mass that is extremely dry (this morning's GPS PW being only about 5 mm). So, we can expect some wind and perhaps some mountain clouds and sprinkles. The main impact of this system in the Southwest will be a period of strong, Santa Anna winds in California as the 500 mb ridge builds over the Great Basin during the next 48 hours. Clear skies and low humidities led to the coldest morning so far this Fall. It was 30F here at the house - our first freeze this Fall - and I had turned the heat on Monday afternoon in anticipation of this. Most of the routine reporting sites in southeast Arizona had freezing tempertures this morning (Wednesday November 10th). 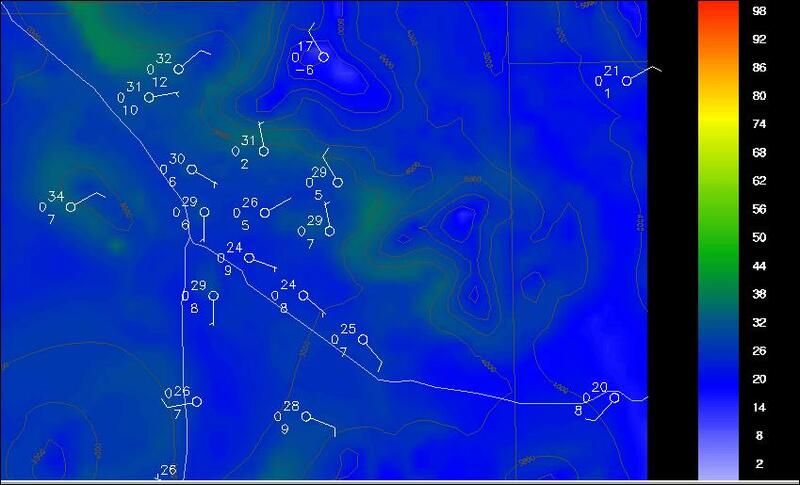 Stations with 30 to 32F included: Rincon, Carr, Headquarters, Safford, Black Hills, Muleshoe Ranch, and Nogales. Stations with middle to upper 20sF were: Sasabe, Rincon, Empire, Douglas, Rucker, Trail Cabin, and Stray Horse. The coldest morning low I noted was 22F at Columbine on Mt. Graham. Brrrrr. Clear skies and light to calm winds led to a crisp, cool Fall morning. Here at the house the low temperature fell into the 30s (39F) for the first time this Fall, while it was a mild 50F at the airport. I see that Douglas, down in the far southeast and at 4000+ ft elevation dropped to 32F - the first freezing temperature I've noted this Fall. 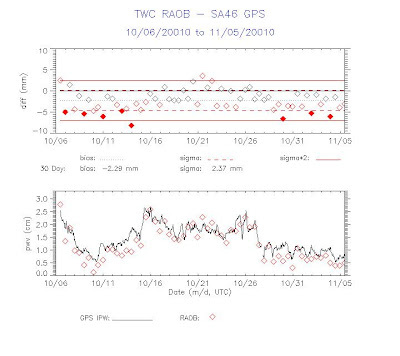 Interesting differences at the two closest RAWS sites - Mt. Hopkins (7120 ft) had a low of only 48F but Rincon (8209 ft) had a low of 37F. The site at Mt. Hopkins reported winds of 10 mph or more during the night and so there was little radiational cooling at that exposed site. After the windy nights during the past week, we're back to more typical radiative cooling at night. The low this morning here at the house was 42F. However, the airport appears to have had a much warmer low of 53 or 54F - which is quite typical, with the Rillito Wash area being about 10F cooler than the "official" low for Tucson. October turned out to be a fairly wet month, in comparison to the 13 Octobers that I've kept records here at the house. Total rainfall was 0.90" with measurable precipitation on 6 days. About 2/3rds of the month's total fell within less than an hour on the afternoon of Wednesday, October 6th, when strong thunderstorms moved northward across the city. This was the third wettest October of the past 13 years - the most rain fell in 2000 (5.06") and 1.16" fell in 2006. The driest October here during those years was 1999, with no rainfall. There have been 7 of 13 years with less than 0.10" of rain during October - so it's been typically a very dry month in recent years. It has been a mild Fall also and I haven't had to turn on the furnace yet (last year I had to fire it up on October 29th). The last rain occurred on October 22nd and it's been very dry since then. 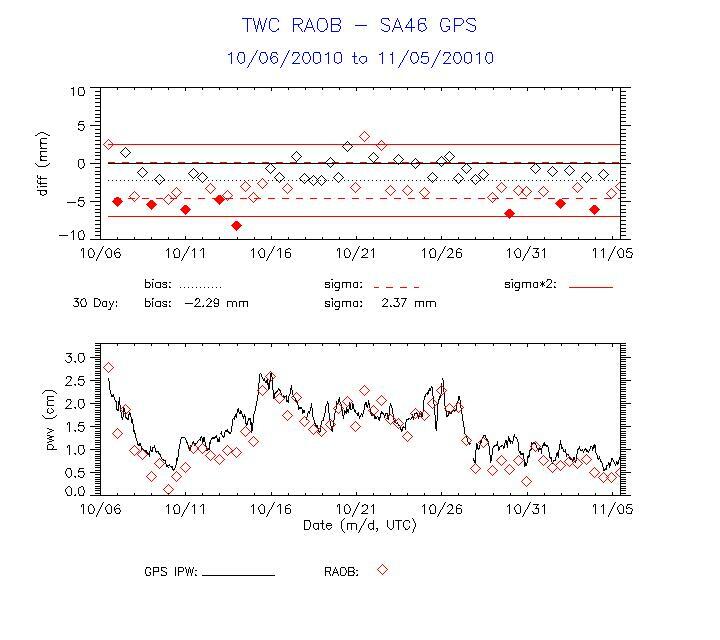 The plot above shows the comparison of GPS PW with the TWC sounding data here. The RRS soundings have been much drier than the PW data values, with differences between the two observations running 3 to 5 mm during the past week. 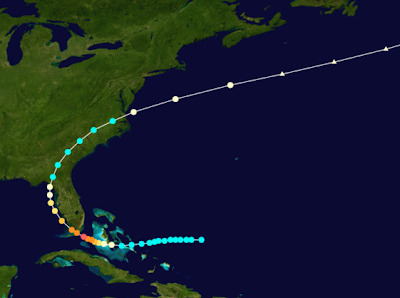 Weak Hurricane Tomas threatens Haiti with torrential rains today as it moves northward. Sadly, thousands of Haitians still are living in tent camps, after the devastating earthquake earlier this year. 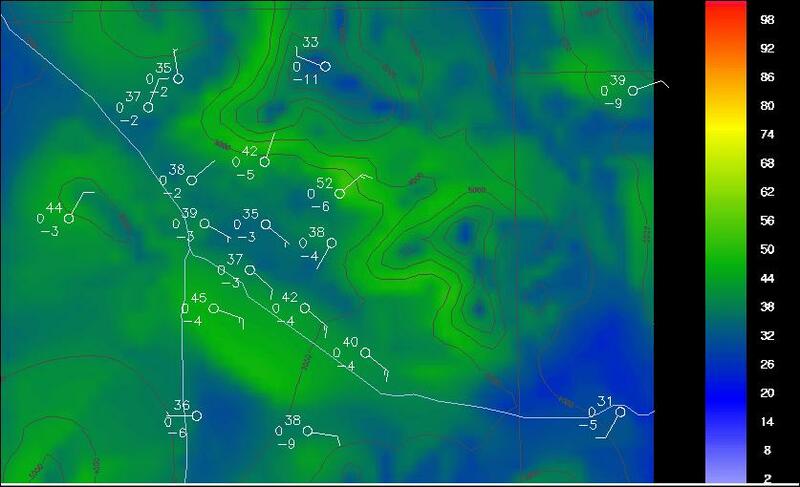 The surface plot above shows the very warm temperatures near sunrise this morning (about 5:45 am). The easterly winds persisted overnight, keeping the low temperatures from dropping very much during the night. The low this morning (Thursday, Novemeber 4, 2010) here at the house was only 64F, or 16F warmer than yesterday's low). Late yesterday afternoon I took a look at the Atmo WRF-NAM forecast for low temperatures this morning, and compared the model forecast to the NWS grid-point forecast lows. The model forecast lows tended around 10F or so higher than were the NWS forecast lows - continuing the trend of last several days. Other lows in the metro area: DM AFB 69F and Atmo 71F. So, the NWS grid forecasts tended to be too low, except at Sells, and the WRF-NAM point forecasts tended to be much closer to observations, except at Sells, where the model was much too warm. Yet another indication of how accurate the Atmo versions of the WRF model, tweaked for southern Arizona, are becoming with time and with Mike Leuthold's continuing adjustments. After a day of gusty winds at mostly 30 to 40 mph across southern Arizona, the sunset last evening was blurred by dust in the air. Here at the house, it was quite windy most of the day, with gusts I estimated up to around 35 mph and dust was sometimes blowing down the Rillito Wash. However, the most notable winds in southeast Arizona have been those reported at the Mt. Hopkins RAWS site. The data for this station indicate gusts of over 50 mph for most of the past 24-hours. The maximum winds reported during this period at Mt. Hopkins have been from the east at 61 mph with gusts to 75 mph. In comparison, the Atmo rooftop anemometer on campus has had a max gust of 54 mph during the past 24-hours. 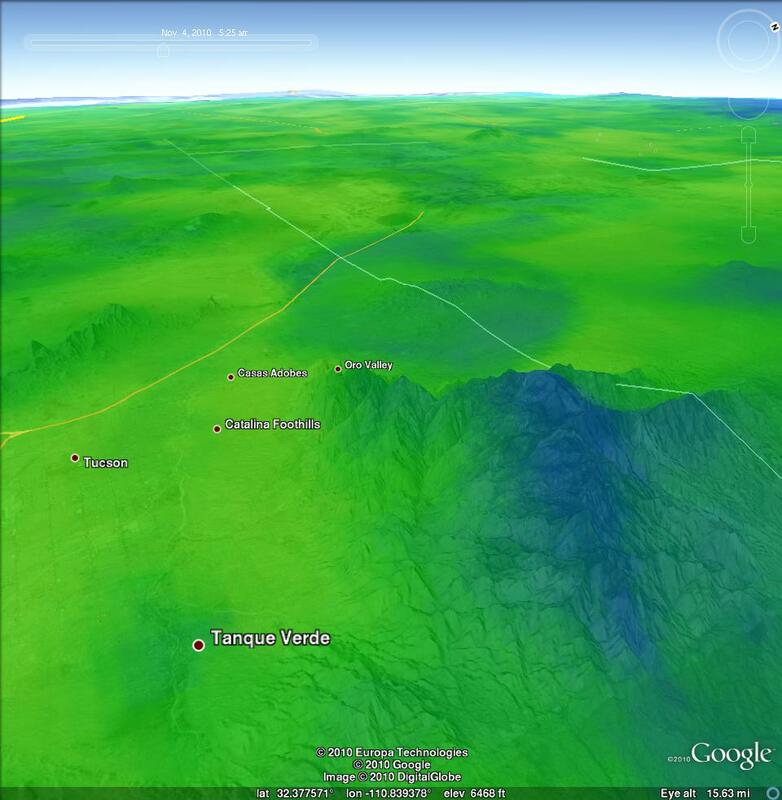 Map at top shows Mt. 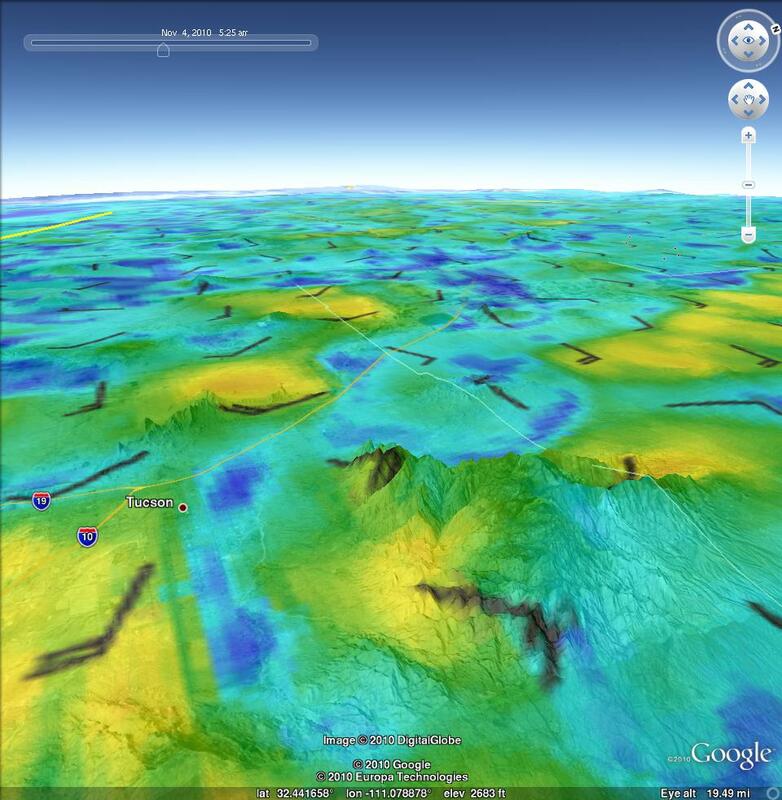 Hopkins (in the Santa Rita Mountains south-southeast of Tucson) and the higher Mt. Wrightson to the east-northeast. There is a terrain gap immediately to the east of Mt. Hopkins, just south of Mt. Wrightson. Photo at bottom shows the Santa Ritas looking east-southeast. Mt. Hopkins, with the square telescope structure on top, is in the foreground and Mt. Wrightson is to rear and left. Presumably, the very high winds at the Mt. 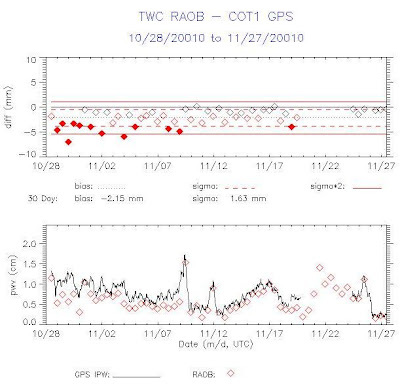 Hopkins RAWS station (just below the telescope elevation) are due to local flow effects around Mt. Wrightson and through the terrain gap. This of course assumes that the anemometer at Mt. Hopkins is functioning properly. Finally, another interesting wind observation this morning, related to the intense cyclone in the Gulf of Alaska. The sounding (12 UTC 4 November 2010) at Annette Island, Alaska, indicates an 850 mb wind from the south-southeast of 91 kt. Quite impressive! The model resolution appears to be too coarse to resolve the Rillito basin thus low temperatures are not well forecast in that area. The links to the GE overlays are now listed on the WRF page at the atmo web site. This morning illustrates nicely what a tremendous challenge it is to forecast minimum temperatures across the Tucson metropolitan area, under certain synoptic settings. 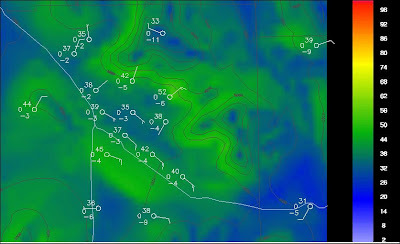 The current, pronounced easterly pressure gradient (4 to 5 mb from Tucson to Deming NM) led to winds occurring much of the night across most of the city. However, some places experienced at least a brief period of nearly calm winds, and these areas recorded much lower minimum temperatures. So, we find that low temperatures only fell to 64F at the airport, DM AFB and the Atmo weather station; however, here at the house the low was 48F and the low at the Empire RAWS station (4650 ft MSL) was 45F. The Empire site apparently had nearly calm winds during only 1 hour - as per, 6 am 55F; 7 am 45F; and 8 am 63F. I don't have wind data here at house, so I don't know how long the winds dropped off. The other nearby, high elevation, RAWS sites were just as variable - Rincon at 8209 ft MSL had a low of 47F, while Mt. Hopkins at 7120 ft MSL came in with 56F. The NWS forecast lows for tomorrow morning from Green Valley north across the metro area are in the low to middle 50s - which seems like a middle-of-the-road approach, splitting the difference between what the temps might be in calm vs. windy conditions. Out of curiosity, I took a quick look at the Univ. of Arizona Atmo run of the WRF-GFS model initialized at 11 pm last night. 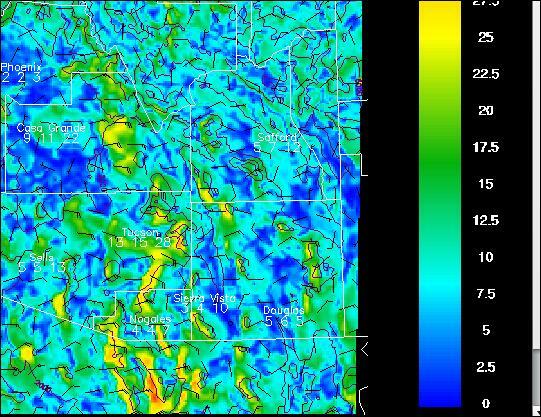 The WRF forecast of 10m winds, valid at 6 am, is shown in the top graphic. 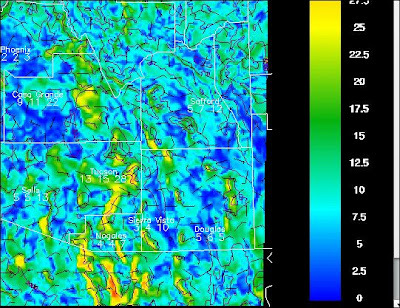 The model forecasted higher winds at higher elevations, and, significantly for temperatures, a band of stronger winds extending from east of Tucson westward across most of the metro area. The model also forecasts very light winds along the Rillito Wash along the north side of the city (the region where the house is and where temperatures are often much colder than the "official" lows). The WRF forecast of 6 am temperatures at 2 m is shown in the bottom graphic. The model accurately forecast the warm temperatures across most of the metro area, but was too warm in the calm area along the Rillito, and also appears too cold at the higher elevations. Again illustrating, what a problem temperature forecasting can be in an orographically complex area such as we live in!